Whether you are a newcomer to the crystal world or an experienced healer, this directory will help you to find exactly what you need for your healing work. The original Crystal Prescriptions covered crystals that were readily available at the time of writing, many of which dealt with physical symptoms. But the crystal world has moved on rapidly since then and more than 450 new crystals have come on to the market so a new volume is called for. It does not supersede the first volume. It is an adjunct to it. Many of these new generation stones have a higher vibration than those historically available. They rapidly raise awareness, lifting the frequency of the physical and subtle bodies, helping to assimilate an influx of higher vibrational energies and expanding awareness. Nevertheless, the new generation stones still have a practical healing application, although for some that healing takes place at a psychological, psyche or soul level. In the last few years there has been an influx of exceptionally high vibration crystals that are harnessing the power of the highest dimensions to assist humankind to evolve. The frequency of these crystals is finer and lighter than those previously known. Where they really come into their own is in helping to bring about a vibrational shift of consciousness for the Earth and everyone on it. Literally taking us into a new dimension – or, rather, opening all possible dimensions. Indeed, there are many crystals becoming available now whose stated aim is to usher in a ‘new age of awareness’ of being both human and divine at one and the same time. However, the crystals also point out that we cannot achieve this unity until we’ve done our own personal healing and growth work – with which they also assist. These new crystals didn’t arrive with instructions for use (but you can use my book The Crystal Experience to learn how to tune in yourself). It’s rather like having a totally new programme installed on a computer without operating instructions and then having to fathom out exactly how to utilise the enormous potential it offers. Fortunately I’ve been running crystal workshops that have attracted some very experienced crystal workers and ‘beginners’ who were eager to learn so we’ve explored that potential together and you can reap the benefit in this book. In the context of this book, disease or illness is a dis-ease, the final manifestation of spiritual, environmental, psychological, karmic, emotional, mental or physical imbalance or distress. Healing means bringing mind, body and spirit back into balance and facilitating evolution for the soul. It occurs at a subtle energetic level. It does not imply a cure. What Does this New Directory Do? This directory is, as with volume 1, first and foremost a ‘first-aid’ guide to assist you to deal with specific issues. It lists conditions and matches them to the crystals that can heal them, whether the issue arises at a physical, emotional, mental or spiritual level. However, crystal healing does not deal primarily with specific conditions. Being a holistic system, it addresses dis-ease on more subtle levels, often bringing to light the underlying causes of a condition. This is particularly so when using the new generation high vibration stones as they rapidly clear blockages before realigning the whole system. Why are So Many More Crystals Included? Well, apart from the fact that so many more crystals are now available, there are infinite possibilities to cover because every body is different. As I’ve said, crystal workers believe that the frequency of our planet and of our bodies is being raised. That our consciousness is expanding through multidimensions and that each person is at a unique and very personal stage of spiritual unfoldment and assimilation of the new vibrations. Therefore, different crystals are required depending on individual energetic frequencies. There are crystals to remove blockages and to adjust the physical and subtle bodies to facilitate the assimilation of the new vibrations, and also ones that take a fresh approach to old problems. Many of these crystals work from the spiritual level of being, having a subtle effect on the mental, emotional, psychic and physical bodies. An internationally known author, astrologer, psychic, healer and workshop leader, Judy Hall has been a karmic counsellor for over 45 years and is the author of the million selling Crystal Bibles. Her books have been translated into fifteen languages. Her first novel Torn Clouds was published by (O Books), February 2005. O Books also publishes Crystal Prescriptions Volume 1. She lives in Dorset, UK. She was recently voted the Kindred Spirit MBS personality of the year 2014 and has appeared four times on the Watkins MBS list of 100 most spiritually influential living writers. 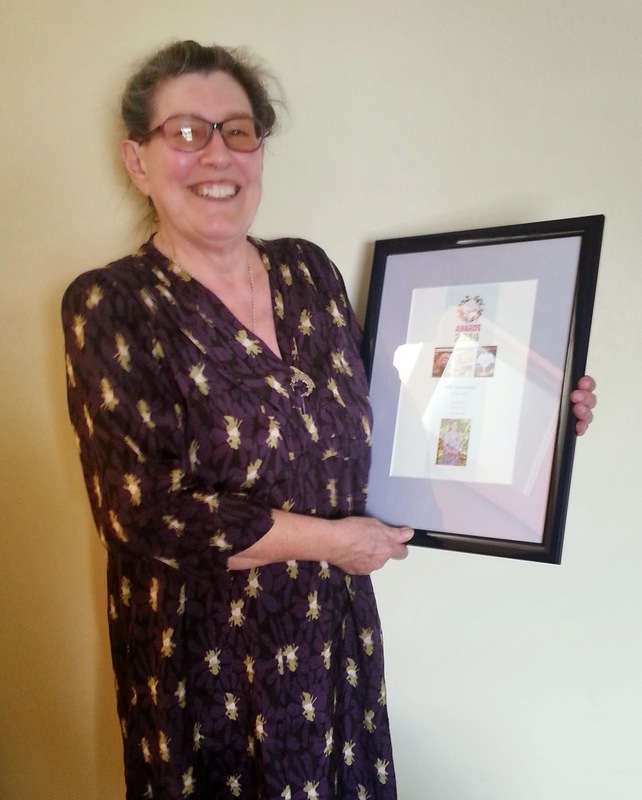 The photo to the left shows Judy with her Kindred Spirit award.